Available providers are OSM, Cloudmade, which gets its tiles from OSM, and OpenAerial. Sadly OpenAerial is currently offline. Red Tiles downloaded when using OpenAerial..
Nutiteq, a software company specializing in mobile location-based services and applications, released MGMaps Lib SDK 1.0. Android developers can use the Library under the terms of GPL to create Map applications using Cloudmade’s Map Tiles. 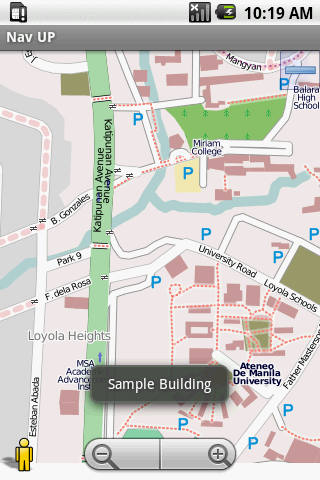 Cloudmade gets its content from Openstreetmap. Android developers are seeking a replacement to Google maps API for their map applications. The site admin of Anddev.org alias plusminus succesfully used Openstreetmap as the provider for Map tiles in his map application OpenStreetMapViewer. His code is open source under a Creative common attribution-noncommercial-share alike 3.0 unported license. You can download the code in the anddev.org website.